I’ve called these my “cookies when I’m not supposed to be eating cookies” for a good while now and make them year round, but they’re also fantastic for upping your milk supply. It’s as simple as going heavy handed on ingredients like chia seeds, flax seed and oats while adding in some brewer’s yeast but this combo will be a healthier choice over a box of oatmeal cream pies and easier on your wallet than ordering lactation cookies from a local bakery. Stir together oats, flax seed, chis seeds, brewer's yeast in a medium bowl. Add in peanut butter, vanilla extract, honey, maple syrup and stir. Toast coconut (either on stovetop or in oven). Then add toasted coconut on top of chocolate chips and wait a couple minutes. (This allows for the chocolate chips to melt a little bit and create a more balanced chocolate flavor. It's optional but I think the recipe tastes better with an even chocolate taste. Stir until well mixed. If you feel like it's too dry, add a bit more of your favorite wet ingredient. Chill mixture for half an hour. Once chilled, roll into small balls. I use a tablespoon to shpe the balls. Store in an airtight container for about a week in the fridge or freeze for a while longer. 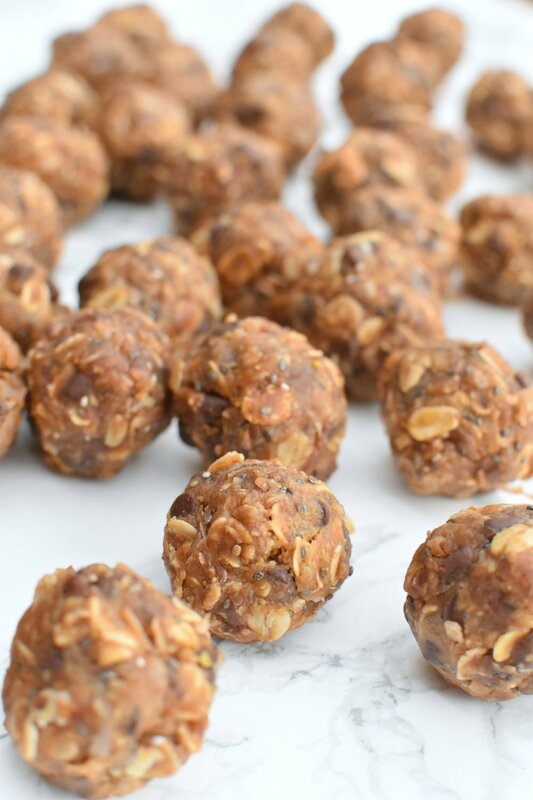 If you want to make these without concern over your milk supply, simply skip the brewer’s yeast and go lighter on the chia seeds (mainly to avoid the inconvenience of them getting constantly stuck in your teeth). If you’re looking for a healthy, guilt free chili, you should just go ahead and close this tab. This recipe is always a hit and is one of my favorite comfort foods. Also, because of the flavors, it’s one of those recipes that work all year long. You don’t need to be stuck inside on cold and dreary weather to enjoy this one. It works well even when it’s 100F outside. I recently entered it into a chili cookoff and it took home the winning prize. Since then, it seems to be on a lot of minds to get a hold of the recipe. I’ve been asked enough since last night that I figured I would quickly write up the recipe for easy access. Below is a shot from my favorite recipe book, the Lily & Val Keepsake Kitchen Diary. I love that I can not only only have the recipe but remember the memories that the recipe has been a part of. Of course, I’ve added that it’s officially award winning, now. In your stock pot, saute the onions and garlic in the olive oil and lime juice over medium high heat. Add in the cooked chicken, chicken broth, beans, chiles, and seasoning. Bring to a boil, stirring often, and then reduce heat to simmer. Simmer uncovered for 45 minutes to an hour to let those flavors soak in. best! Turn off the heat and stir in the cream cheese. Stir constantly until all of the cream cheese melts, then stir in the heavy cream. Top with all kinds of goodness. My favorite toppings are sliced avocado, tortilla chips, (tons and tons) of cilantro and sour cream. Something happened when I moved to Texas. The part of my brain that was just ok with tacos seemed to switch on and now I've become one of those people who can always go for one. Last year during my Whole 30 rounds, we introduced to the idea of making our own taco seasoning. I'm not sure why it didn't occur to us earlier. It's incredibly easy and it tastes so much better than the pre-made packs (plus, it's healthier too). After a good while of comparing recipes and experimenting with our favorite spices, we finally settled on this recipe for our taco nights. Mix all ingredients together in a small bowl. Store in airtight container for up to 6 months. This is perfect for about 1.5lb of beef/chicken. I personally tend to go heavy handed when it comes to smoked paprika because I just love it so much. If you're not as much of a fan, simply cut back. This is also a pretty mild recipe. If you'd like a little more heat, add 1/2 tsp of cayenne pepper to the recipe. Well, it was great while it lasted. We look back now and sort of cherish the times when James would eat whatever was on his plate without question. Gone are those days. Luckily, he isn't fully repelled by vegetables, but we have found it harder to make sure he's getting all the nutrients he needs. 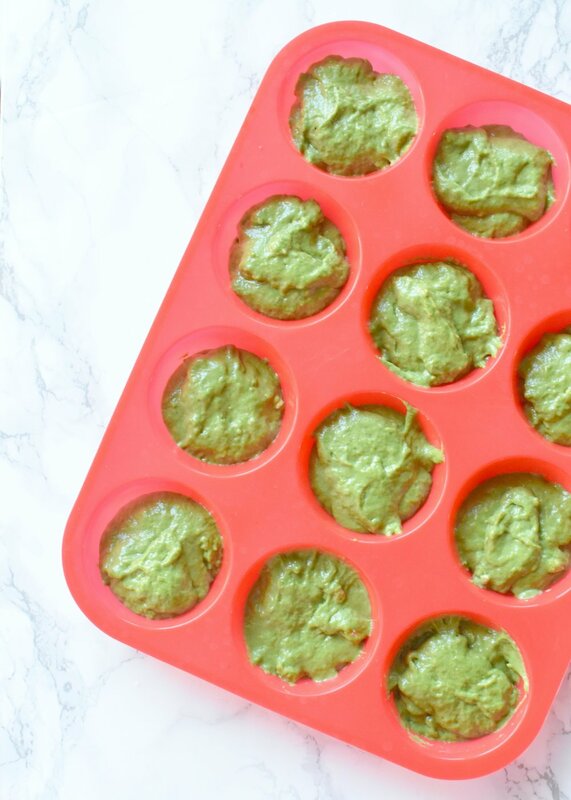 I am not an expert on toddler foods, but these little spinach muffins have been a lifesaver for us. They're the perfect afternoon "treat" and make me feel a little better about the fact that he throws most of his veggies from his meal on the floor. I ran across this Organic Coconut Nectar in my pantry which was clearly a Costco impulse buy that I had forgotten about. You can use any sort of sweetener you prefer. I've tried the recipe with both this and granulated sugar. There wasn't a huge difference between the two batches, in my opinion. I would always recommend using ingredients you already have on hand and are familiar with. Don't hesitate to branch out from this recipe! 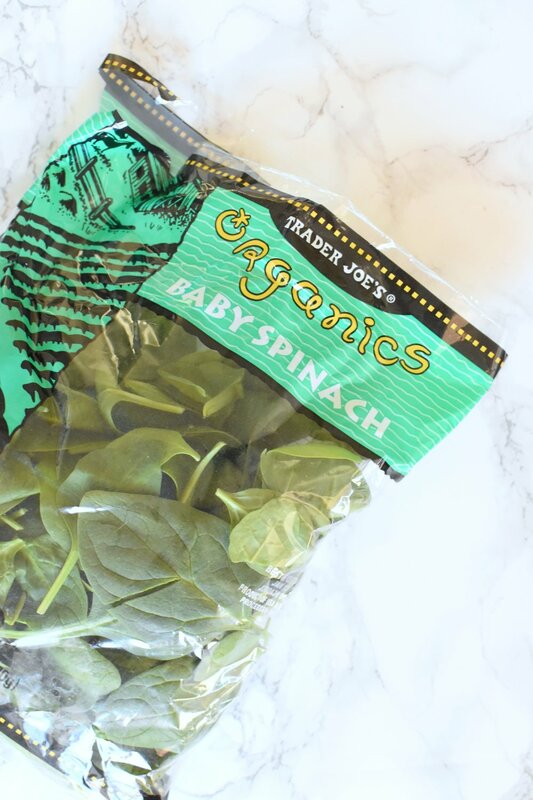 Maybe add in some coconut extract next time or see if you can sneak just one more handful of spinach into the recipe without your little one becoming aware of how healthy these actually are. Play around with it and let me know what fun concoctions you come up with! Puree the spinach. I emptied the bag (and added some handfuls from another bag) into my steamer for a few minutes before blending. Add the wet ingredients in with the already pureed spinach and blend again. The heat from the spinach brings the coconut oil to a liquid making everything a lot easier to mix together. In a separate bowl, add the flour, baking powder, baking soda and salt to the blended wet ingredients. Stir to create a dough-like texture. Fill a cupcake pan until it's about 2/3 of the way full, allowing room to rise. This is the cupcake pan I use and I love it. Bake for 20 minutes at 350F or until a toothpick comes out clean. This recipe makes about 15 muffins. I also want to stress that you can use any sweetener of your choice. Cream together the brown sugar, granulated sugar, and butter in stand mixer for a couple minutes. Beat in the vanilla and salt until combined. Add flour. The dough will be dry. Add milk slowly beat until dough starts to come together to desired consistency. You may not use the full amount of milk and that's ok. This makes a BIG batch. This recipe, as easy as it is, makes around 4 cups of dough. If you're looking for a quick snack for one, cut it in half or into thirds. Place the olive oil in a large pot over medium-low heat. Peel, quarter and slice the onion into thin strips. Once the oil is hot, saute the onion and minced garlic for a few minutes to soften. Add the chicken stock, shredded chicken, lemon zest, and crushed red pepper to the pot. Raise the heat to high, cover, and bring to a boil. Once boiling, reduce the heat to medium, then simmer for 5 minutes. Stir in the couscous, a little over 1 teaspoon salt, and black pepper to taste. Simmer another 5 minutes. Then turn the heat off. After serving, stir in the crumbled feta cheese. Taste and salt and pepper as needed. We've made the recipe with both couscous and orzo pasta. It's pictured with oro pasta. We prefer the couscous but it turns out beautifully using either. If you go with orzo, the cooking time is roughly the same, still using 1 cup. Today is day 30 of my Whole 30! I weigh in tomorrow and will share then all about what the past 30 days did for me. In the meantime, I wanted to share with you some of our favorite recipes. These have each been approved by Kyle who although didn’t do the full Whole 30 with me, had a huge say in what we ate everyday. Preheat the oven to 425F. Drain the liquid from the salmon and crumble the fish into a large mixing bowl. Add sweet potato, egg, almond flour (which, for the record we used coconut flour once and it turned out just as great), scallions, parsley, dill, salt, paprika, pepper and mix together. Brush the pan (or parchment paper on pan) with the ghee. Use a 1/3 cup measuring cup to scoop the caked and drop them onto the pan. Flatten or round the patties with your hand until they are uniform in thickness. Bake for 20 minutes, then flip them and bake for 10 more minutes or until golden brown. We made this every week. Since we were trying to go easy on the red meat, this was one of our favorite go to meals. We would steam 2-3 sweet potatoes to have on hand for James and for making these. In a wide mouth quart-size jar, combine all of the ingredients. Blend with an immersion blender for 1 minute. Store in the refrigerator for up to 1 week. I put this on almost everything. Seriously, it goes so well on everything. Neither of us are really into ranch but this tasted so good. You can use any combo of herbs. I love rosemary, so of course that had to end up in the recipe. Preheat oven to 375 degrees. Wrap each apple slice with prosciutto and place on baking sheet. Combine melted coconut oil and cinnamon in a small bowl and brush onto apples, reserving half for later. Bake for 10 minutes. Remove, flip, and brush with remaining brown butter mixture. Sprinkle with rosemary. Bake an additional 10 minutes until apples are cooked and prosciutto is crispy. I went heavy on the coconut oil, cinnamon and rosemary . . . because, why not? Preheat oven to 400 F degrees. Clean and dry the drumsticks and season with salt and pepper. Set aside. In a small skillet heat the olive oil. Add the garlic, smoked paprika, red pepper flakes and the herbs. Cook for about 1 minute over medium heat, do not burn the garlic. Pour this olive oil mixture over the drumsticks and make sure the drumsticks are coated thoroughly with the olive oil/paprika mixture. Place the drumsticks in a 9x13 baking dish and bake for about 45 minutes or until chicken legs are cooked through. We used thighs more than drumsticks and it still turned out wonderfully. For us, the chicken came out more blackened each time. I'm not sure how to go about fixing this and will be experimenting in the future to try and achieve that perfect red color. We had a small group dinner this week that was Indian themed. Kyle and I were so excited because I kind of dropped Indian in the first trimester and I'm ready to get back on the train. We volunteered to make dessert. I spent way too long looking for a good Indian dessert, but a lot of it was rice pudding or something similar in texture. Don't get me wrong, we love rice pudding. It's just that we were going to a dinner in Texas and the people here don't really strike me as ethnic food enthusiasts. I scanned a few different recipes for homemade lassis, but I wanted something dairy free. Eventually, I ended up making my own recipe where I kind of just threw everything together. It should be noted that this recipe filled a huge pitcher. You could easily cut it to the number of people you're serving or even just make your own with completely different fruit. Blend mangos, peaches, honey and both cans of coconut milk together. Use the Silk Coconut Milk to thin to the desired consistency. How about that for Easter lunch?! This is a recipe straight out of my favorite new cookbook by Claire Thomas from The Kicthy Kitchen. It combines black truffle salt, gruyere and honey for some suh-wheet payoff. My ultimate favorite and super easy snack is baked brie. You can make it so many different ways and in so little time. I recently took advantage of a home sale at Chapters and purchased their little brie baker out of curiosity. Turns out, it's incredible. Looks like I'll be getting one of these for all my friends this year! Here's my favorite new recipe for baked brie. Olive oil, cracked pepper and rosemary baked brie. Sprinkle as much as you want on (go easy on the olive oil. It's easy to get too much and it mess with the texture of the creamy cheese). Put it in the oven for 10/15 min on 350 and boom . . . an instant crowdpleaser! Our grocery store only seems to stock huge amounts of bright green bananas. We prefer ripe bananas but hey, that's just us. This means that we usually have to buy bananas in larger bunches and hope we eat them when ripe. Sometimes we do. Sometimes we don't. This was a week we didn't. Instead of throwing them out in the compost this time, I decided to whip up a quick loaf of banana bread. It was easy, quick and kind of fun. Who doesn't love a little afternoon baking? * I actually ran out of regular sugar halfway through and so I did half of the 3/4 cup sugar as brown sugar which is what gives it that rich brown coloring. I found this recipe a couple weeks ago and fell in love. This has been the year of food exploration for me. I'm learning what to eat, how much to eat and most importantly what not to eat. I served these up at a small group and they were gone fast. When one of my friends who is currently pregnant and has gestational diabetes was able to eat quite a few of these with no complications, I decided to make them again for her baby shower in a double batch. Gone again! In a large mixing bowl, mix together goat cheese, bacon, garlic powder, onion powder, and salt. Make small (roughly 1 inch) balls with your hands. I used a round tablespoon to scoop. In a small bowl, add the chopped pistachios. Roll each ball in the pistachios to coat then place on a plate. Refrigerate for at least 30 minutes before serving. Store in an airtight container in the refrigerator. Good Lord, I hit the jackpot tonight with a simple recipe that was just as much of a hit as it was easy. One of the great things about this recipe is the simplicity. It has room to incorporate more of what you love. Next time, I'm going to mix in a tablespoon of honey with the goat cheese before I spread it on. This makes for a great snack or light lunch and I will definitely be making them again. Now just sit back and enjoy the compliments. I bought a large pack of boneless chicken thighs and when it came ready to marinate it and grill it, my husband casually asked that I not make it the same way I had a few days earlier. I quickly jumped on pinterest and tried to find something quick, easy and healthy. Turns out that's not that easy. So, I decided to kind of make my own. Kyle and I love garlic, so we went heavy on it. If you want to add some of your own favorites and minimize others, go for it. This is my first time trying this recipe but it seems easily customizable to whatever you prefer. It turned out great and will make excellent leftovers. Best of all is that it isn't heavy and won't have you feeling like you're about to explode after eating it. Note: these pictures are before it went to the oven. Everything is so colorful before it gets cooked! I love this version of pancakes so much that I don't think I'll be able to ever go back to the normal version. Not only that but it is packed with protein, with just around 14g of protein in every pancake (that's right, each one), it gives you a great boost to start your morning without already feeling like you have to work extra hard to burn it off. The measurements aren't exact, which is why I say around 14g each. Check the labels and do the math, then, make sure to give yourself a huge pat on the back because you haven't actually indulged much at all. This recipe makes enough for both me and Kyle. Put all of the ingredients in your blender or processor and then make regular pancakes. The texture will be a little different when cooked, maybe not as fluffy as a regular pancake, but you know what? That's something I'm definitely willing to sacrifice for being able to eat a pancake breakfast with zero guilt.